Updated and revised edition of At Home with the French Classics (1998). I made this in the slow cooker on low for 8hrs and then followed the recipe to puree and then served with ham. Classic French food is hotter than ever. But one thing hasn’t changed—few of us have the time, the patience, the technique, or the cream and butter allowance to tackle the classics as presented by Julia Child’s Mastering the Art of French Cooking. The good news is—we don’t need to. 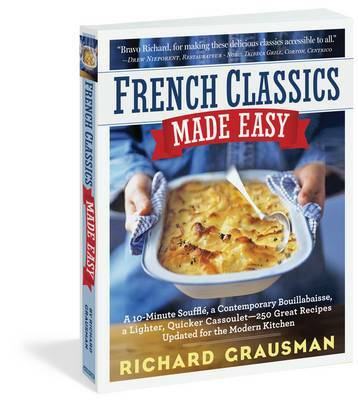 For the past 40 years Richard Grausman, America’s premier culinary teacher, has been training American chefs in a simpler, better way of French cooking, and in French Classics Made Easy—a refreshed and updated edition of his original collection, At Home with the French Classics—he shares all of his extraordinary innovations and techniques. Golden soufflés in ten minutes. A light and luscious chocolate mousse that can be made as a cake, a chocolate roll, soufflé, or pudding. Plus Cassoulet, Boeuf Bourguignon, Coq au Vin, Bouillabaisse, Poached Salmon with Beurre Blanc—in all, 250 impeccably clear, step-by-step recipes in range of anyone who knows how to boil water or dice an onion. When a step isn’t critical, Grausman eliminates it. If something can be done in advance, he does it. Plus he’s cut the amount of butter, cream, egg yolks, salt, and sugar; the result is health-conscious recipes that don’t compromise the essential nature of the dish. Techniques are illustrated throughout in line drawings. It’s the grandness of French cuisine, made accessible for both entertaining and everyday meals.